Monster Animals: Does ‘Rampage’ Get the Science of CRISPR Right? We here at STAT cover CRISPR a lot. But it’s not every day we get to cover Dwayne “The Rock” Johnson. 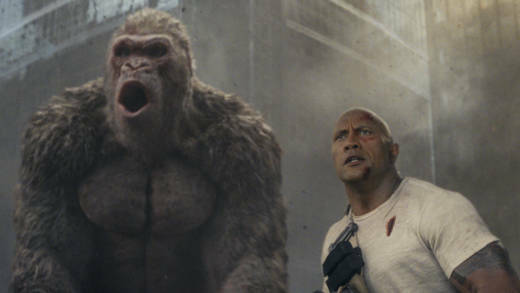 The Rock and the genome-editing technology meet in a new movie, “Rampage,” coming out Friday. Through a freak accident, a gorilla, a wolf, and a crocodile ingest some CRISPR complexes. The animals — whose genomes become edited to make them stronger, bigger, faster, and more aggressive — soon wreak havoc on the city of Chicago. It’s packed with action, gratuitous destruction, and an anti-poaching message, along with at least a dozen references to CRISPR, some of which are even accurate, say STAT reporters (and amateur movie critics) Megan Thielking and Andrew Joseph, who saw an advanced screening this week. Here are their thoughts — both scientific and cinematic — on the film. This conversation contains spoilers. MEGAN: So that was incredible. ANDREW: This movie has everything: rich biotech baddies with clothes as fancy as their skyscraper headquarters; meditations on how mankind is just as primitive as the animal kingdom (and how we’re actually a horrible and much worse species); and a gigantic wolf with a taste for helicopters. But before we dive into the movie, let’s give a bit of background. Megan, in addition to being a serious science journalist, you’re a big Dwayne “The Rock” Johnson fan. How did we end up at this advanced screening? MEGAN: I have been working up a STAT pitch on this movie for months. This movie features both science (my beat) and The Rock looking contemplatively out over a cornfield (my aesthetic). My original idea was to review the movie with an expert in genome-editing. I actually invited four CRISPR experts, all of whom were “busy.” Dejected, I then invited Drew. ANDREW: Fifth choice, I’ll take it. It was a huge relief to see CRISPR mentioned right from the get-go, because I really sold this story to our editors. It also made me feel better about expensing Sour Patch Kids and Raisinets. ANDREW: To get technical for a second, the title screen is sort of accurate. Yes, James Clapper, then the director of national intelligence, did list genome-editing as a threat in 2016. But when I saw the 1993 line, I kind of chuckled to myself. At first, I thought, sorry, Jennifer Doudna and Feng Zhang, apparently The Rock beat you by like 20 years, your patent claims are worthless. But then I thought more about it and realized what they were referring to. This history of modern CRISPR discovery does, by some accounts, date back to 1993, even though the term CRISPR wasn’t used for another decade or so. And the title page suggests that scientists were using the system to edit genomes 25 years ago, which we know was not the case — that’s a much more recent feat. Anyway, I’ll get off my soapbox now. Megan, to my surprise, the movie started in space. What’s up with that? MEGAN: I was not surprised whatsoever that this movie started in space. But, essentially, an evil company is testing CRISPR in space on a lab rat. Only the rat becomes a gigantic rat, the space shuttle explodes, and three CRISPR vials fall to earth. Enter Dwayne Johnson and his best friend, George, the albino gorilla he rescued from poachers and who he communicates with using sign language. And, yes, that’s not exactly how CRISPR works, but it’s not completely off base either! The idea is that the biotech company “weaponized” CRISPR research and introduced the genes of a bunch of other animals into our three monster-animals to give them traits such as those bat wings, or the spikes of some other animal, or the strength or regenerative abilities of certain kinds of bugs. This is all explained very quickly in some exposition by our disgraced yet heroic geneticist played by Naomie Harris (whom I last saw in “Moonlight,” and here’s hoping that, like that movie, “Rampage” scores a surprise best picture win at the Oscars). “I’m talking about extremely specific results,” says Naomie, who, in my mind, I am on a first-name basis with. One question I have is whether these animal features are polygenic as opposed to tied to one gene. That would make it a lot harder to introduce them into another species. But scientists have CRISPR’d beagles to make them super jacked, so it’s not insane that CRISPR could be used to change the features of an animal. Whether it could be used to double the size of a gorilla overnight, well, that might be a different story. And for the beagles, the CRISPR’ing happened when the dogs were embryos, not fully grown. The CRISPR’d animals of “Rampage” also become super aggressive, and behavior might be harder to change through editing. Maybe they just ramped up testosterone production somehow? I don’t know, Naomie didn’t explain that part. You raised a good point as we left the movie, Megan. Where are the regulators? MEGAN: All of the CRISPR work in this movie seemed to be WILDLY unregulated. There’s no FDA cameo here. There’s no Scott Gottlieb in skinny jeans. There is Jeffrey Dean Morgan, whom I will refer to as Denny Duquette, his character in “Grey’s Anatomy,” from this point forward. He plays a government agent with a faint Foghorn Leghorn accent who helps The Rock and Naomie Harris take on the CRISPR company, called Energyne. MEGAN: It’s Denny Duquette, but, yes, that was amazing. In real life, there’s a whole system that keeps research in the U.S. involving CRISPR in check. The Food and Drug Administration and the National Institutes of Health regulate CRISPR as it relates to medical research, of course. But the Environmental Protection Agency and the Department of Agriculture also play a role in overseeing uses of CRISPR. And the Department of Defense — which is interested in genome-editing as a potential bioterrorism threat — has poured a lot of money into CRISPR research. So there are a lot of people overseeing this kind of work. Not just Denny. ANDREW: Exactly, although the dastardly siblings running Energyne (who complain about their stock price tanking after their space shuttle explodes!) maybe found a way around all of them, you know, by like doing their work in space. Anyone home at NASA? On a different note, this did make me think of a common movie plot point. As our colleague Damian Garde wrote last year, Hollywood loves a biopharma villain. There’s clearly some fear among the public about what scientists can do, particularly when it comes to rewriting the code of life. I do wonder if this movie will be people’s introduction to CRISPR. Are they going to go home and Google it and see headlines invoking “designer babies”? Is this just going to make people scared of CRISPR, even if they know that it probably won’t lead to a mutant crocodile that can King-Kong-style crawl up the Sears Tower? This is totally made up, but I imagine the marketing people at CRISPR Therapeutics are discussing this right now! ANDREW: I’m definitely giving this movie too much credit, and you’re absolutely right, but there were things in the movie that made me think of real CRISPR issues. Naomie Harris’ character was trying to use CRISPR to cure her brother of some unidentified disease. And her big discovery was how to ensure that CRISPR complexes could be delivered to every cell in the body, not just a few. Granted, efficient CRISPR delivery had some not-great consequences when it happened to a crocodile, but it’s a huge goal for researchers using CRISPR or other types of gene therapy for clinical purposes: ensuring that edits happen in enough cells to, for example, generate enough of a normal protein to overcome the faulty protein produced by a certain disease mutation. As an audience member, I will gladly let The Rock wink at me, even if it means sparing a little scientific accuracy. ANDREW: I did hear you giggling a lot whenever The Rock was on screen. Let’s talk about how they want to stop the destruction of the entire city of Chicago and potentially the world by delivering an antidote. The antidote, we’re told, will curb the unchecked aggression of the animals but not reverse the other changes, like bringing George back to his original 7-foot-tall size. But that’s more in line with Pokemon than actual CRISPR science. In theory, you could re-edit the genes of an animal again after editing them initially with CRISPR, but there’s no magic solution to immediately reverse CRISPR and bring peace to the Windy City like the movie suggests. And if there were, I’m not confident you could deliver it by putting it in the purse of a woman who then gets consumed by a CRISPR’d animal. Which happens. And here I am again making a reach, but, whatever, this movie’s got layers. When they were talking about an antidote or reversing those changes, I immediately thought about gene drive! Granted, that’s a different use of CRISPR — editing animals to force traits throughout a whole species — and reversing gene drive isn’t just re-editing the animals that have already been edited. But researchers who are working on gene drive are cognizant of the fact that playing with nature can have unintended consequences, so it’s probably a good idea to have a real-life CTRL-Z at the ready. MEGAN: Agree wholeheartedly. I and the entire city of Chicago and the suburbs (Go Cats!) would like to thank science for the antidote. Final thoughts on the science, Drew? ANDREW: I’m sorry I’m still harping on this, but back to the fear of genome-editing. Obviously, there are a whole lot of ethical and safety issues involved with playing with DNA, and I think most scientists take those seriously. But it’s interesting to see this movie given that we now have treatments on the market involving editing DNA. Sure, they’re not CRISPR-based therapies, but clinical trials using CRISPR are recruiting patients. And the CAR-T therapies and the gene therapy Luxturna (see this piece by our colleague Eric Boodman to get a sense of how it works) are big deals for patients, and there are a lot more coming down the pike. ANDREW: I did see you scramble to write that part down in your notebook when it happened. Anyway, your final thoughts, Megan, the Statler to my Waldorf? One final question: If you were in a real-life “Rampage” situation, what would you do? ANDREW: The first lesson is, listen to Dwayne “The Rock” Johnson. If he says don’t put George the gorilla on a plane, don’t put him on a plane! How about you? MEGAN: I would hop on The Rock’s back and let him carry me while I used my inhaler. ANDREW: So what do you think, can we convince our editors to send us to an advanced screening of The Rock’s next movie? See you at “Skyscraper”? MEGAN: Catch me at the midnight premiere. Thanks to STAT’s very own CRISPR expert, Sharon Begley, for reviewing this review to make sure we didn’t screw anything up.